For decades, children have loved Mickey Mouse and his pals, and today’s toddlers are no different since Mickey is one of the first television characters that they can easily recognize. For some reason this silly mouse captures children’s attention and gains their affection. So it should really comes as no surprise when your child asks for Mickey Mouse toys almost as soon as they can talk. After thorough research, we’ve handpicked the best Mickey Mouse Toys for 1 year old children and we’re certain you’ll find the perfect gift for your toddler! Our picks include great toys for boys and girls, so some nice gift ideas for your son or daughter. After tons of research, our top choice for Mickey Mouse Toys for a 1 year old is the gorgeous Mickey Mouse Plush Toy! When making our decision, we took into consideration how well each toy would encourage your child’s imagination and provide long term entertainment for them. Measuring 17 inches high and made from soft polyester material with adorable embroidered features, this stuffed Mickey Mouse has vibrant colors and he’s sure to become your child’s favorite sleeping buddy and best friend. Easy for your child to carry anywhere and everywhere, he’s soft and cuddly and sure to be an honored guest at tea parties and become your child’s traveling companion on both short and long car or plane rides. 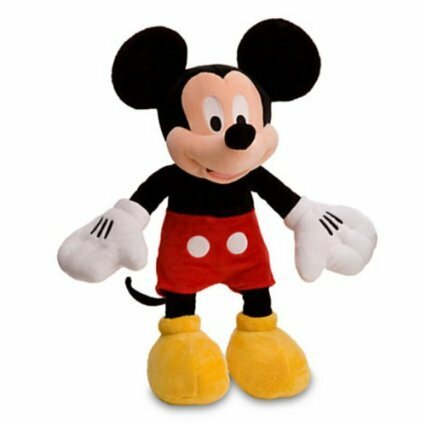 Excellent Likeness To Mickey Mouse: Unlike many stuffed Mickey toys that only vaguely resemble Mickey Mouse, this plush toy really looks like the iconic Mickey Mouse both in features and clothing right down to his white gloves. 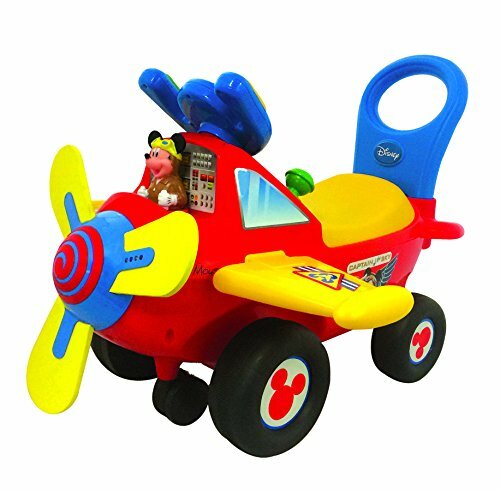 Whether your toddler is a huge Mickey Mouse fan or simply loves airplanes, this Kiddieland Disney Mickey Mouse Clubhouse Plane Light and Sound Activity Rider is a great ride on toy for one year olds. The plane is brightly colored, has gears for your child to shift that make revving sounds, and has a real rotating propeller that has light up patterns. Turn on the plane’s radio and your toddler will hear radio frequency sounds as well as music and the Mickey Mouse march song. They love watching Mickey move to the music! The plane also has realistic take off and landing sounds to really engage your toddler. The wings fold up for easy storage and the propeller turns when your one year old pushes buttons or they makes the plane move. There is also a back push handle so your child can push the plane or you can push your child in the plane. The propellers are made of sturdy foam so they won’t harm your child if they try and stop the spinning propellers with their hands. Ease Of Assembly: Parents love that they don’t have to do much to assemble this plane. All they have to do is put on the back handle and it’s ready to go! 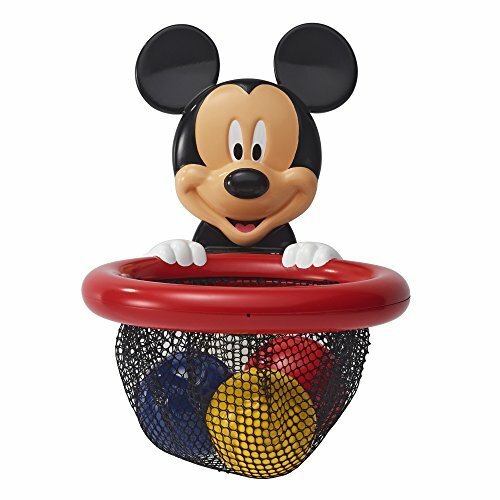 Make bath time more fun with this little The First Years Disney Mickey Mouse Bathtub Baketball Set for one year old toddlers. The set consists of a small hoop and net that adheres to the wall over the tub by suction and three character balls for your child to shoot into the basket. Your toddler will really enjoy trying to get the balls into the net and taking them out again. Several parents told us that their older kids love playing with this bath basketball set too! The balls are solid so water cannot get in and cause mold which is another feature that parents really like. It holds firm when attached to the wall giving you peace of mind and keeps your child entertained at bath time. After bath time is over, you can place the balls in the net and fold it down to keep it out of the way for the adults to bathe or shower. 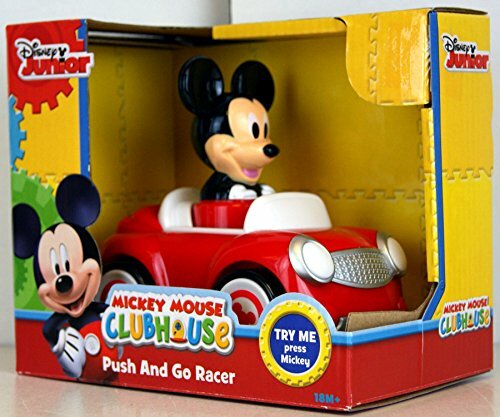 Cars and trucks are a basic childhood toy and this Disney Mickey Mouse Push And Go Racer Car is a great car for your growing 1 year old. This red car with Mickey at the wheel measures about 4.5 inches long. What makes this car exceptionally fun for small children is the fact that when they push down on Mickey’s head, the car will take off and run quite a distance. Your one year old toddler will have great fun racing this car across the floor and a few parents said that their kids love to race it across the table and watch it crash to the ground! Of course it’s extremely durable so it can withstand all kinds of toddler challenges who enjoy chasing after this adorable car. Perfect for small hands, it’s a great toy for keeping your little one engaged and having fun. Great Size For Small Children: This car is good size and is neither too large or too small for 1 year olds to easily play with. It is the perfect size for little hands. Encourages Your Child To Crawl Or Walk: Your child is going to want to run this car over and over again, which means once they they push on Mickey’s head and the car goes, your child will need to chase after it, which will help them develop their gross motor skills. Every since Fisher Price introduced the Little People Sets, they have been extremly popular among young children. So what could be more fun for one year olds who love Mickey Mouse than this Little People Mickey and Minnie House Playset! This 9 piece set includes Mickey’s house, Minnie’s house, and Pluto’s dog house, as well as a table and two chairs, plus Mickey, Minnie and Pluto. The houses all snap together and also have lots of fun things for your child to discover, including a letter in a mailbox, a cake hiding in the oven and cheese in the refrigerator. Kids love the fact that the front door will open and close and that they can spin the heart on the chimney on Minnie’s house. To open the oven, your little one just needs to press down on Minnie’s teapot! The cute mouse-shaped chairs and table allow your 1 year old toddler to let their imaginations flow as they host tea parties for Pluto, Minnie and Mickey. This Mickey and Minnie House Playset is a great stand alone toy or can be combined with other Little People Mickey and Minnie Sets to build a complete Mickey Mouse World. Whether you are looking for some fun bath toys for your 1 year old or simply want a few simple carry along toys for your child to use to engage in imaginative play, this Disney Mickey Mouse And Friends Bath Toys Set can provide your little Mickey Mouse fan with hours of fun. 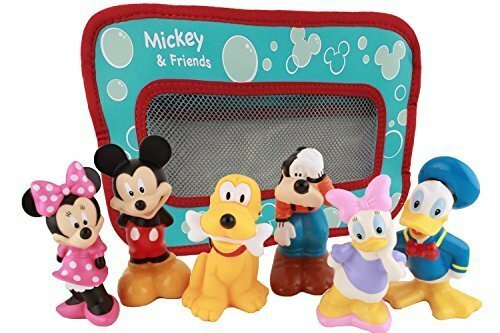 This bath set includes Mickey, Minnie, Donald, Daisy, Pluto and Goofy and comes in a plastic zip case that has suction cups on the back to store the toys after playing in the tub. However, these toys can easily be used both in and out of the bathtub for added fun at playtime. Each figure is up to 5 inches tall and they are the perfect size for little toddler hands. ToyReviewExperts.com is a participant in the Amazon Services LLC Associates Program, an affiliate advertising program designed to provide a means for us to earn advertising fees by advertising and linking to Amazon.com and affiliated sites. When readers buy our independently selected toy picks, we may earn a small commission to support our work. This does not in any way influence the toys we pick for our Toy Shopping Catalogs Of The Best Toys & Gifts For Kids Of All Ages. Our Toy Catalogs are created following hundreds of hours of dedicated research and feedback from our continued interaction with parents, teachers, relatives, friends and customers.